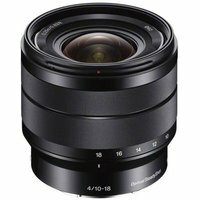 The Sony E10-18mm f/4 OSS Lens expands the Sony E mount lens system and is designed for Sony's smaller APS-C compact system cameras. This lens is great for capturing dynamic landscapes, group shots, cityscapes and general use out and about. The Sony E10-18mm f/4 OSS lens features a Super Sonic Wave motor for quiet responsive autofocus, a lightweight design with special sealing against dust and moisture.